The Hipcats - vintage jazz, swing band and jazz singer for weddings, corporate functions and other events across the UK - based in Bristol, Bath and the south-west. 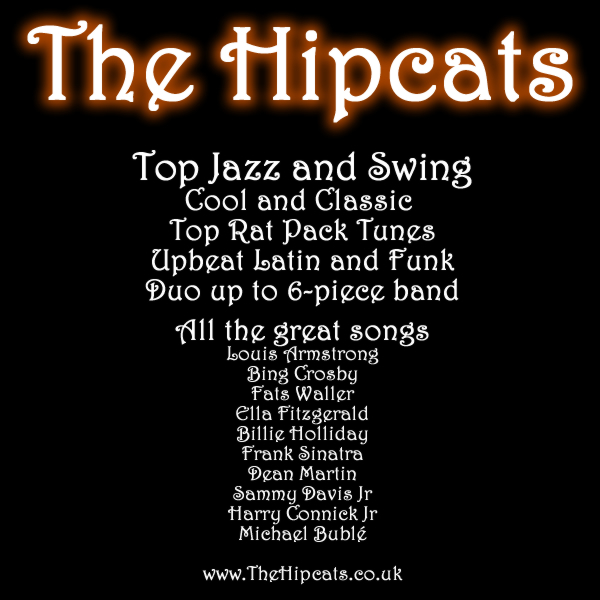 The Hipcats - Vintage Jazz and Swing Band for that classic 1920s, 1930s, 1940s & 1950s sound. We would love to join you for your special vintage event - wedding, party, corporate function, etc. We have a variety of line-ups which can suit your needs from the classic vintage lounge duo sounds of a vocalist and pianist, to our swinging jive six-piece. Add a bit of vintage jazz, swing and jive to your event for with our classic sound. Contact us to find out more about our classic vintage music here. Jazz and swing have been the most smooth and classy thing to have at an event since the 1920s. From the exciting sounds of Louis Armstrong and Fats Waller to the crooning of Fred Astaire and Bing Crosby, the mellow sound of Ella Fitzgerald and Billie Holliday, and the cool Rat Pack sounds of Frank, Dean and Sammy - this music has been the soundtrack to the 20th Century and remains just as fresh in the 21st. This is what The Hipcats do.